A hammerhead board that has become commonplace in snowboard alpine races. The effectiveness of the overwhelming turn performance that comes from a shape that has a reduced overall length and an increased effective edge length is widely recognized. In addition, many manufacturers have adopted the hammer head shape also in “free style carving” which has recently become explosively popular. 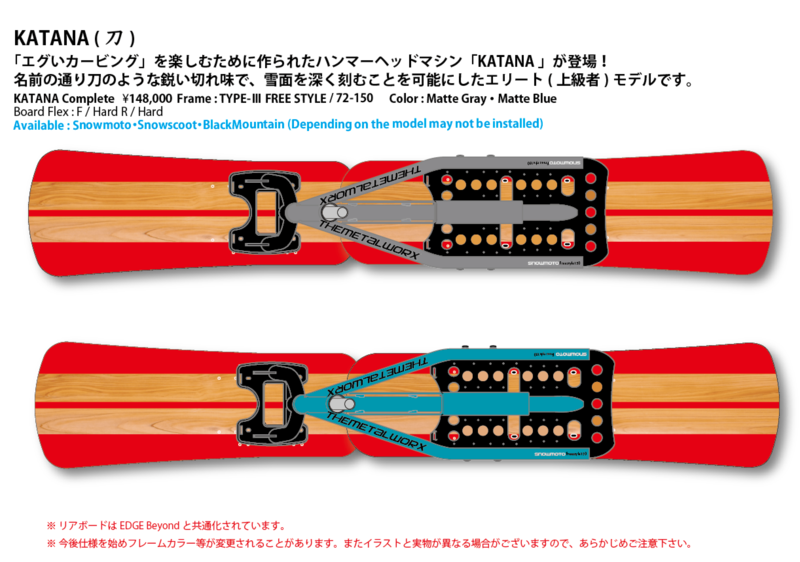 In the operation and turn performance of the snow bike from before, One step lead SNOWMOTO also researched to incorporate the technology and techniques quickly, and repeated the tests of prototype boards by riders from home and abroad, and finally reached this form. It is not just a hammerhead that imitates a single board shape like a snowboard. The snow bike has two boards on the front and back, and the turn by the steering wheel operation is the basic operation, so the top shape and the lower height are reset based on the combination of the fine side curves of the front and back boards and the test data. Even without cutting the handle, the quick and sharp carving turn that starts with only the hammerhead specific horn and the sense of stability like being wrapped are unprecedented. This is a high performance model for elite (advanced) riders who want a sharper board than a proud all-round board or a person who wants to engrave a deep carving like a snowboard! The “Freestyle Frame” has a head angle of 72 ° and a rear truck of 150 mm so that it can exhibit the best performance on Pistenburn and mid-slopes with the appearance of a gravity frame from this season. With this short position track, you can get the small turn with light operability by enjoying the torsion and bend performance of the back and forth of the rear board as much as possible. This is a very different point from other companies’ snow bikes, and everyone will realize the difference if you compare them! The steering tube size and headsets style be changes. The headsets will be upgraded to internal head parts (Press-fit type) from 2020 years model. Because, It contributes to weight reduction by making the tube thin by expanding the head tube (Φ 50). The durability of the headset itself has been improved and we have gained the dual benefit of ensuring smoother rotation while preventing steering wheel deflection.